Professor Paul Bender was a world leader in making major instrumentation usable by all chemists. 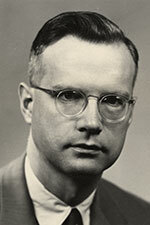 He became dedicated to the task in the 1950s, and before other chemistry departments had realized the importance of shared instrumentation, Bender had already established formal classes to teach students how to use the instruments for their own research. Bender’s heritage is still in force, as the PBCIC continues to lead in training, capabilities, and breadth of support in major instrumentation for chemists. Due to a bequest Paul and his wife Margaret McLean Bender provided, the Center has been able to maintain state-of-the-art equipment to this day. More details about Paul Bender can be found here.